A partnership agreement has been reached with the Association of Christian Schools International (ACSI), which guides the process of Florida teacher certification and re-certification, as well as certifying hours and credits described above for teachers, administrators and support staff. The Master In-service Plan allows teachers to earn credit for conferences and workshops attended, school in-service sessions, religious courses, seminars and the like. The cost to your school is minimal. In many cases, schools save thousands of dollars when compared to the cost of reimbursing teachers for college level courses required for their re-certification. The “fiscal year” for this program is July 1-June 30. Dr. Barry Morris is the manager for this program. He is highly trained and extremely knowledgeable. Dr. Morris has provided several orientations to this process at our Lutheran Administrators Conference, the Educators Conferences, and at Fast Track Seminars. You are strongly encouraged to attend one of these workshops for more information about the program. I know that you may have questions about the process. Prior to subscribing your school, please do not hesitate to be in touch with me if you have questions. I am sure you will join me in giving thanks to God for this blessing. God’s peace to you. William Carey University School of Education Students with Disabilities Module Program has been approved for Inservice Credit by Association of Christian Schools International to meet the Florida Department of Education SWD renewal requirements as set by the Florida Legislature 2014. There are five modules in the program (each earning four inservice points). These modules can be completed within the school by individuals or teacher teams. The cost of each module is $5.00 an individual ($20.00 for the entire SWD program 20 points). Make your check out to William Carey University. 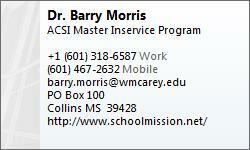 Submit responses to Dr. Barry Morris at bmorris@wmcarey.edu. The Bureau now allows live scan fingerprinting if your school has a provider. The attached instructions explain the use of a fingerprint card which you can receive from my office. Just request the card and a CT111. I will mail them to your school. I will need to know the teacher’s name. Best way to reach Dr. Morris – by email! !